When is a Post Mortem Photograph Really a Post Mortem Photograph? 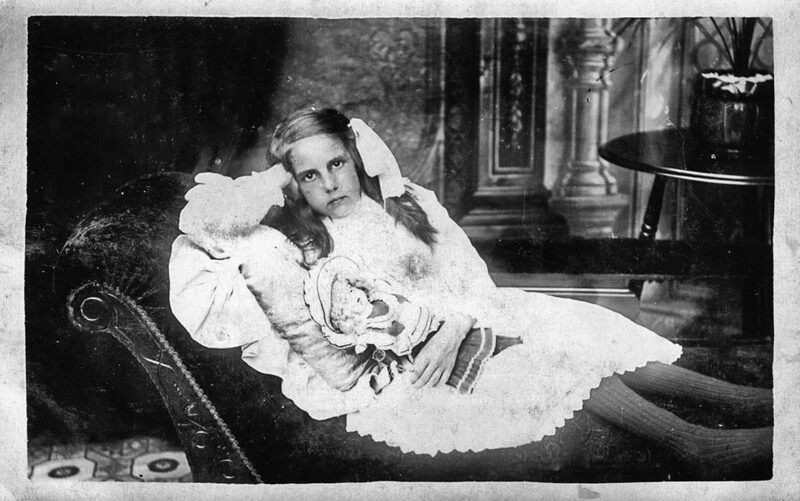 Although many people now find post mortem photographs rather uncomfortable viewing there was a distinct period in Victorian times when they were not unusual. Whatever our view of them today it is perhaps understandable that in an era when families were large and child mortality common there was a desire to have a photographic memorial of a lost child or other relative. There is a distinct interest amongst some collectors of cabinet cards and old photographs in general in this genre, so much so that a photograph claiming to be taken post mortem will usually sell for a high price, often well in excess of £100. Given the perceived values of these items it seems reasonable to expect to have a high level of confidence in their authenticity yet this is very hard to achieve. If you see a PM photo of Jessie James you can be pretty sure it’s real and it’s easy to find copies on the internet together with details of how and why it was taken. Similarly if a body is photographed in a coffin then it’s likely to be real. If you want to collect PM photographs you will often come across examples on ebay and elsewhere advertised as PM photographs or often as “probably post mortem” or “possibly post mortem.” A clear case of caveat emptor. The photograph at the head of this article is one that I bought (relatively cheaply) that was advertised as “possibly post mortem.” So how likely is really that this is a PM photograph? There are several elements that might suggest a PM photograph, the most obvious being her eyes which appear to be painted on to the photograph. She’s posed in an everyday dress and clutching her doll so it fits the practice of posing a dead person this way. Her left hand looks very limp and her right hand supports her head in an awkward manner. You can easily see how her body could be propped up in this way (whether alive or dead). On the other hand a closer inspection shows that this is a real photographic postcard and there are elements on both sides of the card which help us narrow down the time it was published and whether it fits the profile of a PM photograph. Kodak introduced photographic post cards, i.e. blank postcards onto which a personal photograph could be printed, in 1903. 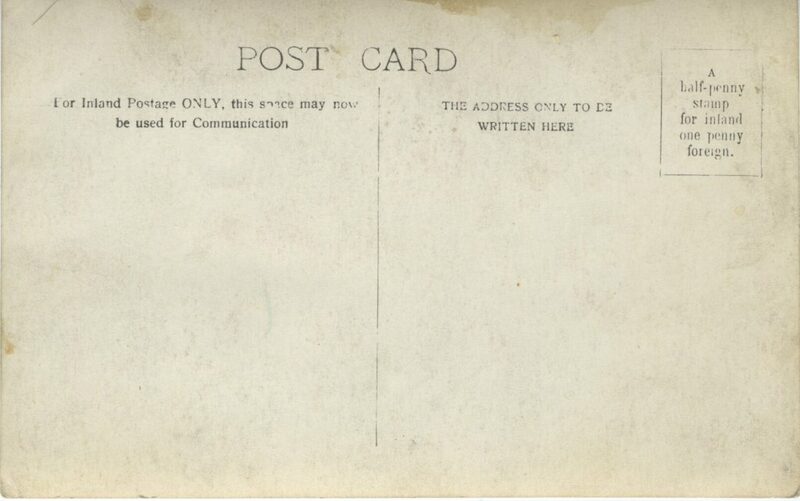 Divided backs to postcards, with one side for the address and the other for comments didn’t appear until 1907 and using a white border around the main subject to save on printing costs first began to be used in 1915. We can see that the stamp box tells us that the cost for inland postage is one halfpenny and the Great Britain Philatelic Society shows that the cost of sending a postcard was increased to one penny in 1918. These clues allow us to date the card with a fair degree of accuracy to being produced between 1915 and 1918. Most PM photographs were produced in the late nineteenth century so the time period makes it unlikely that this is a PM photograph. There is certainly something odd about this photograph but I doubt that it is a genuine PM photograph. It’s much more likely that the photographic studio decided to paint the girl’s eyes this way to make it look better or possibly her eyes really did look like that! Thanks for the shout-out, Alex and Maxine. I also enjoyed your essay.